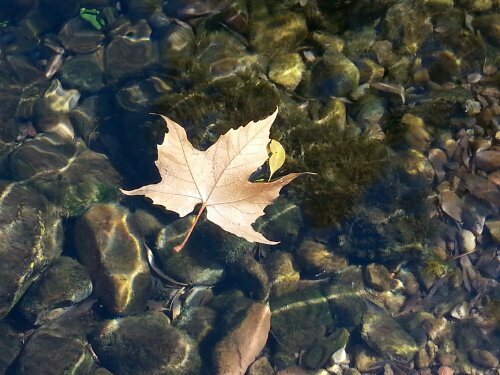 I sit quietly on the edge of the crystal clear spring watching the leaves who have lost their color, fall slowly onto the clear water below. They remind me of snowflakes drifting from above, not one, like the other. It’s God‘s way of saying it’s time to move on; Winter is coming. I take my hiking shoes off and dip my worn feet into it’s coolness. The leaves go floating by as if little boats on their way to another destination. It is peaceful; serene. If I knew no one would chance by, I would take my clothes off and be one with nature and float with the leaves. Sometimes it’s just fun not knowing where you are going:) I like that kind of spontaneity. Which is why I hiked all the way down to the natural springs to find it. Being in the outdoors always centers me and brings me closer to God. The beauty here is breathtaking. Some may not see it that way, as the trees are almost all brown. A little yellow and orange peak in every now and then, but the vibrant red is no longer. I see beauty all around me, as I sit here feeling okay, as I am about to embark on the holiday season without that someone special again. For a moment, I feel a little sad, but it goes away, because I have so much to be thankful for. God has put so much in my life and has allowed me to experience just as much. I have great family and a few good friends and of course, my undying love for those Hallmark Christmas movies. LOL I know, corny and unrealistic. But the hopeless romantic in me will always be there. I get joy out of seeing two people find each other in the midst of the hustle and bustle of the holiday season. It all puts a smile on my face. The leaves are moving on, the snow will begin to fall and new life will spring up all over again. And I will be there to see it all unfold. So… find your peace/joy/happiness this holiday season. The leaves have fallen, the turkey will show itself soon, and the evergreens will smell so amazing!! !